Publics of key member nations of the North Atlantic Treaty Organization (NATO) blame Russia for the ongoing conflict in Ukraine. Many also see Russia as a military threat to other neighboring states. But few support sending arms to Ukraine. Moreover, at least half of Germans, French and Italians say their country should not use military force to defend a NATO ally if attacked by Russia. A median of 39% among NATO publics say Russia is the main culprit in the ongoing conflict in eastern Ukraine. The pro-Russian separatists in Luhans’k and Donets’k (18%) are a distant second. Half say Russia is a major military threat to other neighboring nations. 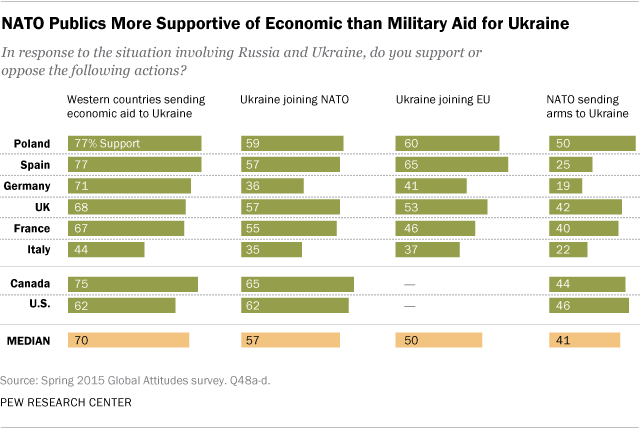 In response to the crisis, 70% among allied countries say Western countries should send economic aid to Ukraine. A majority (57%) also supports Ukraine becoming a member of NATO. NATO nations are hesitant, however, to escalate their involvement in the conflict, especially militarily. Comparatively few support sending arms to Ukraine (median of 41%). And many allied countries are reluctant to uphold Article 5 of the North Atlantic Treaty, which requires NATO members to defend an ally with armed force if necessary. A median of 48% among these publics say their country should use military force if Russia gets into a serious military conflict with a neighboring nation that is a NATO ally, while 42% are opposed. Americans and Canadians are the only publics where more than half think their country should use military action if Russia attacks a fellow NATO member (56% and 53%, respectively). Germans (58%) are the most likely to say their country should not. All NATO member publics are more likely to think the United States will come to an ally’s defense (median of 68%) than to be willing to do so themselves. As the crisis in Ukraine has dragged on, mutual animosity between Russia and the West has become more entrenched. A median of just a quarter of NATO publics now say they have a favorable view of Russia. Meanwhile, only 12% of Russians give NATO a positive rating. And Russians’ favorable views of the U.S. and the European Union have plummeted by more than 30 percentage points since 2013, before the beginning of the crisis. Half of Russians say NATO is a major military threat to their nation. And Russians overwhelmingly oppose Ukraine becoming a member of either NATO (83% oppose) or the EU (68%). At the same time, President Vladimir Putin’s image at home continues to improve amid the conflict. 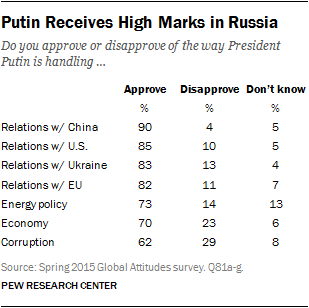 Overwhelming majorities in Russia approve of Putin’s performance on a range of domestic and international issues. This support holds despite the fact that Russians are less happy about the country’s current economic situation than in 2014 and are now more likely to say that Putin’s actions in Ukraine are tarnishing Russia’s image worldwide. Russian nationalism is also at an all-time high – 63% have a very favorable image of their own country, up 34 percentage points since 2013 and up 12 points in just the past 12 months. In addition, 69% of Russians say it is a bad thing that the Soviet Union dissolved, and 61% agree that parts of other countries really belong to Russia. Meanwhile in Ukraine, the security situation on the ground posed a serious challenge to safely surveying the public. Pew Research Center was, however, able to interview in all regions of the country except Luhans’k, Donets’k and Crimea.1 The areas covered by the survey represent roughly 80% of the Ukrainian population. Among those surveyed, a majority of Ukrainians (67%) support becoming a member of the EU. They also favor joining NATO by a 53%-to-32% margin. At the same time, a plurality (47%) expresses support for negotiating with the rebels and Russia. Roughly a quarter (23%) says using military force to fight the separatists is the best way to end the conflict in the east, and another 19% volunteer either both or neither. National differences in the preferred outcome for negotiations may continue to complicate reaching a settlement. While most Ukrainians outside of Donbas and Crimea say Luhans’k and Donets’k should remain part of Ukraine, either on the same terms with the national government as before (51%) or with increased regional autonomy (33%), a majority of Russians believe these two oblasts should secede, becoming either independent states (35%) or part of Russia (24%). These are the key findings of a Pew Research Center survey of 11,116 respondents in eight NATO member countries, including Canada, France, Germany, Italy, Poland, Spain, the United Kingdom and the United States, as well as Russia and Ukraine. The survey was conducted from April 6 to May 15, 2015. In 2014, Pew Research Center surveyed Ukraine from April 5 to April 23, coming out of the field just days before violence began in Odesa and other cities in the east. While the increasingly tense atmosphere in spring 2014 presented some obstacles, the survey included the oblasts of Luhans’k and Donets’k (also referred to as the Donbas region), as well as Crimea. This year, however, security conditions in the Donbas region deteriorated to the point where it was unsafe to conduct face-to-face interviews, especially on the topics covered in this poll. In addition, the survey was too politically sensitive to conduct in Crimea. For these reasons, Luhans’k, Donets’k and Crimea are not included in the 2015 survey of Ukraine. The map below illustrates which areas surveyed in 2014 were not able to be surveyed this year, as well as the west-east regional divide used throughout the report for analysis. Excluding the Donbas region and Crimea can have an effect on the national results, particularly on topics related to Russia and the crisis. To assess this impact, we analyzed the 2014 survey with and without Luhans’k, Donets’k and Crimea in the sample. The findings show that, in general, when the Donbas region and Crimea are included, the national results are more favorable toward Russia, less favorable toward Western countries, and more supportive of secession. The variations on these topics were in the range of 5 to 12 percentage points. Despite these exclusions, the 2015 survey still covers a significant portion of the eastern population and was designed to be able to capture the variety of attitudes within the eastern region. The survey also continues to reveal deep divides between Ukraine’s west and east in attitudes about Russia, Western countries and the crisis, similar to last year. To make it possible to compare 2015 results to those from 2014, in this report we show the 2014 national data excluding the Donbas region and Crimea. This is to ensure that any change reported between 2014 and 2015 in Ukraine is based on comparable populations. Therefore, results for the 2014 survey reported here may differ somewhat from results published at the time, which were based on a survey including Luhans’k, Donets’k and Crimea. For more on the full methods for the survey, see here. For a discussion of the survey sampling design, see here. NATO publics broadly support sending Ukraine economic aid to address the current crisis. And, with the exception of Germany and Italy, majorities say Ukraine should become a member of the alliance. However, other measures to address the crisis receive much weaker support among these allies, or at the least are more divisive. Roughly half or more of Germans (54% oppose), French (53%) and Italians (47%) oppose allowing Ukraine to join the EU, while the Spanish (65% support), Poles (60%), and British (53%) support the idea. Few believe NATO should send military assistance to the Ukrainian government. Support for this measure is particularly low among Germans (19%), Italians (22%) and Spanish (25%). And, with the exception of Poles, three-in-ten or fewer want to increase sanctions on Russia. Still, most publics want to keep sanctions at their current level (median of 49%), rather than decrease them (15%). Among Ukrainians living outside Donbas and Crimea, majorities support receiving economic aid from Western countries (71%), joining the EU (67%) and increasing sanctions on Russia (65%). More than half also want to receive military assistance (54%) and join NATO (53%), though support for these measures is more tepid and regionally divided. Ukrainians in the west are much more supportive than those in the east of becoming a member of NATO (68% in west vs. 34% in east) and receiving military aid (66% support in west vs. 38% in east). Neither western nor eastern Ukrainians, however, want to join the Eurasian Economic Union with Russia (82% and 61% oppose, respectively). Most NATO publics surveyed are reluctant to live up to the promise in Article 5 of the North Atlantic Treaty that member countries will assist allies who are attacked, including with armed force. Roughly half or fewer in six of the eight countries surveyed say their country should use military force if Russia gets into a serious conflict with a neighboring country that is a NATO ally, including just 40% in Italy and 38% in Germany. Only in the U.S. (56%) and Canada (53%) do more than half say their nation should use military action in such a situation. Contrary to their attitudes about what their own country should do, widespread majorities of most NATO publics believe the U.S. would use military force to defend a fellow NATO country. Poles stand out as less certain that the U.S. would come to an ally’s aid (49% would, 31% would not). U.S. President Barack Obama and German Chancellor Angela Merkel have made considerable efforts to downplay any disagreements they have over how to address the Ukrainian crisis. But it is clear their respective publics hold different views. Roughly six-in-ten Americans (62%) believe Ukraine should become a member of NATO and just under half (46%) support sending military assistance to the Ukrainian government. Few Americans (10%) think sanctions on Russia should be decreased. And a majority of Americans (56%) believe the U.S. should use military force to defend a NATO ally. Among Americans, Republicans are much more supportive than Democrats of allowing Ukraine to join NATO as well as sending military aid to the Ukrainian government. Meanwhile, just 19% of Germans support sending arms to Ukraine and roughly four-in-ten or fewer believe Ukraine should join either the EU (41%) or NATO (36%). Germans (29%) are the most likely among allied nations to say that sanctions on Russia should be decreased. And only 38% of Germans say their country should use military force to protect a NATO ally if attacked by Russia. Within the country, western Germans are more favorable of NATO and using military force to defend an ally than eastern . However, the two nations are more in agreement on economic aid – substantial majorities in both Germany (71%) and the U.S. (62%) support sending monetary assistance to Ukraine. Poles are more concerned about Russia’s role in the current crisis than other NATO publics. Seven-in-ten Poles say Russia is a major threat to neighboring countries, compared with a median of 49% of the other seven allied countries surveyed. Similarly, Poles are more likely to blame Russia for the crisis and to have an unfavorable view of the former Cold War power than their NATO counterparts. Perhaps because of this anxiety about Russia’s intentions, nearly half of Poles (49%) would increase economic sanctions on Moscow. Only a median of 25% in the other countries say the same. And 50% back sending arms to Kyiv (Kiev), while just 40% of other NATO member publics agree. NATO publics generally hold Russia in very low esteem: Less than a third in any country give it a positive review, including just 15% in Poland and 18% in the UK. Pluralities in every NATO country except Germany and Italy blame Russia for the violence in eastern Ukraine, including a majority of Poles (57%) and four-in-ten or more in France (44%), the U.S. (42%) and the UK (40%). And roughly half or more in most allied nations believe that Russia is a major military threat to its neighboring countries besides Ukraine. This includes 70% in Poland and 59% in the U.S. Meanwhile, Russians have soured considerably on major Western powers in just the past few years. 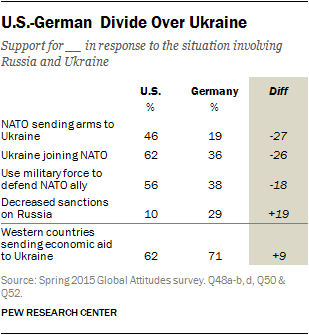 Favorable views of the U.S., Germany, the EU and NATO have dropped by 25 percentage points or more since 2011. Half of Russians blame Western countries for the crisis in Ukraine, with the Ukrainian government (26%) a distant second. Russians also say Western sanctions (33%), along with falling oil prices (33%), rather than their government’s economic policies (25%), are responsible for the country’s current economic woes. And 50% of Russians think NATO is a major military threat to their country; another 31% say it is a minor threat while just 10% believe it is not a threat at all. National pride has reached new heights in Russia. The percentage of Russians who say they have a very favorable image of their own country has continued to climb, from 29% in 2013, to 51% in 2014, to 63% today – the highest it has been in Pew Research Center polling since first asked in 2007. Roughly seven-in-ten (69%) also say it is a bad thing that the Soviet Union dissolved. Russian President Vladimir Putin is faring well with his public during this crisis. Despite the fact that 73% of Russians are now unhappy with their country’s economy, seven-in-ten approve of Putin’s performance on the economy. And even though a plurality (37%) believes Putin’s handling of the crisis in Ukraine has damaged Russia’s international image, nearly nine-in-ten (88%) express confidence in him to do the right thing in international affairs – including 66% who say they have a lot of confidence. 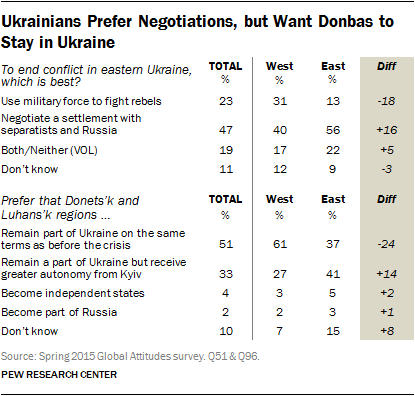 A plurality of Ukrainians (47%) living outside of the Donbas region and Crimea say the best way to resolve the conflict in the east is to negotiate a settlement with the rebels and Russia. Roughly a quarter (23%) would prefer to use military force to fight the separatists, and 19% volunteer both or neither. Eastern Ukrainians are more supportive of negotiations than those in the west (56% vs. 40%), though this is still the most common answer in each region. Among eastern Ukrainians, those who live closest to the conflict areas – the bordering oblasts of Kharkiv, Dnipropetrovs’k and Zaporizhzhya – are the most eager for a settlement (65%). However, negotiations may be difficult, as they have proved to be so far, because of the large divide between Ukrainians and Russians over the future of the Donbas region. As was true in 2014, an overwhelming majority of Ukrainians would prefer Ukraine to remain one country (85%) rather than allow regions to secede (10%). Both western and eastern Ukrainians support unity (91% and 77%, respectively). There is somewhat more disagreement among Ukrainians over the exact terms under which the oblasts of Luhans’k and Donets’k should remain part of Ukraine. Roughly half (51%) say these oblasts should have the same level of autonomy from the central government as they did before the crisis, while 33% say they should have greater regional authority. Western Ukrainians are more supportive of reverting back to the situation before the crisis (61%) than granting increased autonomy to the regions (27%). Eastern Ukrainians are divided – 37% say they prefer the previous status quo while 41% support more independence. Residents of the border oblasts are more supportive of greater autonomy (45%) than others in the east. Regardless of these regional divides, there is very little support in Ukraine for Luhans’k and Donets’k becoming either independent states (4%) or joining Russia (2%). Russians, however, disagree. Just about a third says Donbas should stay part of Ukraine – either on the same terms as before (11%) or with greater autonomy (21%). A majority (59%) believes they should secede, including 35% who say they should become independent states and 24% who think they should become part of Russia.